Keep in mind that you cant store the completed fermented bokashi contents for any serious length of time, but when you convert the material into a bokashi soil, you can store it and use it as a planting mix or soil amendment in pots or in your garden in the same way that you use compost – you can dig it into the hole when planting new plants, or dig it in to the soil around existing plants. 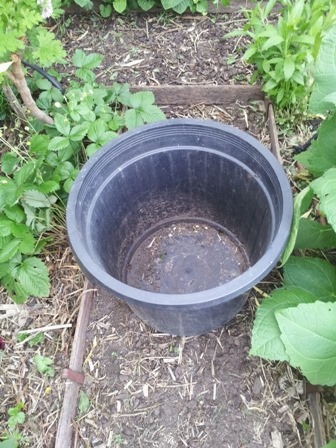 Any large container with drain holes or without a bottom to use as the soil generator – a 40-50cm wide plastic pot is ideal. The construction steps are as easy as filling a pot with dirt! 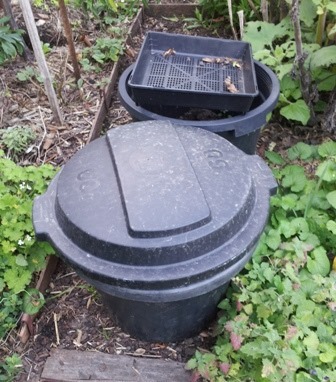 Select a container with drain holes or without a bottom to use as the soil generator – any recycled container will do. Sit the soil generator container over a garden bed or path so any liquids can drain into the soil. 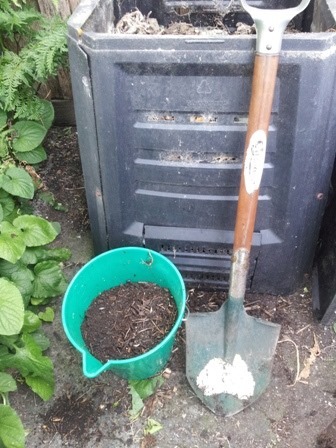 Here I’m using an old 50cm wide plastic pot as the soil generator container, sitting on a garden oath. Next, you’ll need some compost, just dig some out of your compost bin or comport heap. The compost is optional and is used as an inoculant to add lots of beneficial microbes to the mix to speed up the conversion into soil. 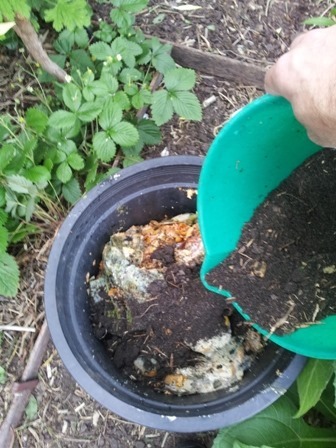 If you don’t have compost, just use soil or recycled potting mix. 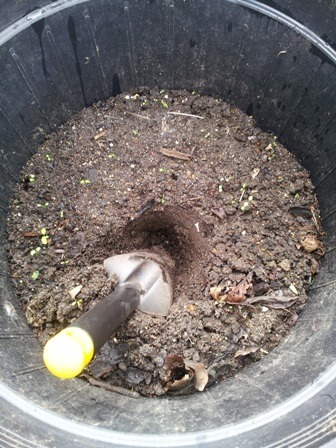 Pour the compost (or soil or recycled potting mix) into the container until it is approximately 1/3 full. Empty the processed bokashi food waste into the container. Notice that the processed food waste still looks like regular food waste, only pickled! OR if you prefer not to do any mixing and want to produce bokashi soil in around 12 weeks then leave it alone and proceed to next step. 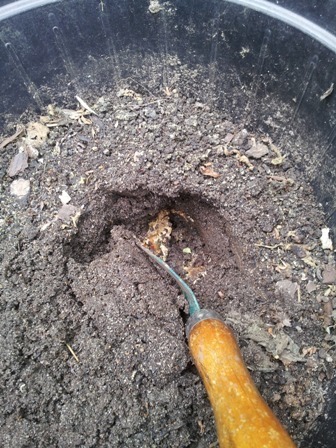 Pour garden soil (or recycled potting mix) over the top of the (mixed or unmixed) bokashi contents to cover them up. 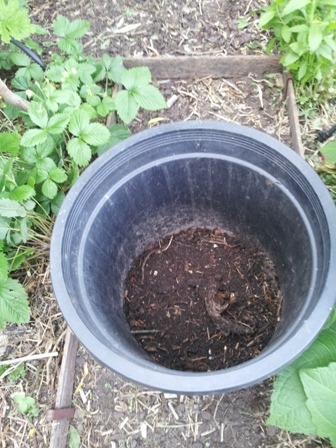 This will create a ‘sandwich’ of three layers with compost (or soil or recycled potting mix) at the bottom of the container, the bokashi contents in the middle, and soil (or recycled potting mix) on top. 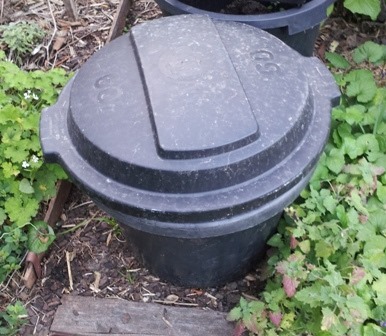 Cover the container with a lid or cover to stop it drying out in warm weather or getting flooded in wet weather. The lid or cover can be loose fitting, and does not need to be airtight. Even a piece of board will suffice. Now just let it sit there for four weeks if mixed, or twelve weeks if unmixed, and allow the microbes to do their work, that’s basically it! The second pot in the background is covered with a mesh tray so rain can enter, this will work when the weather is mildly warm with light rain. Truly complete. The end product is rich, dark bokashi soil, and the original materials are no longer visible. 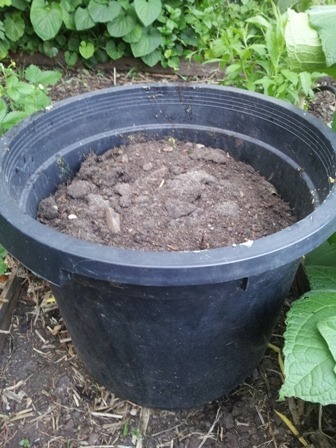 Using a bokashi soil generator you can process bokashi fermented food waste to convert it into soil which is ready to use in your garden or container plants, making it ideal for people with small gardens. 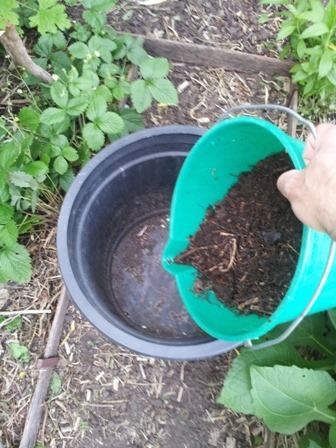 Even for those with gardens who can’t be bothered digging (like me, I’m a no-dig gardener), this is a great way to produce rich organic matter to incorporate into your garden to improve your soil. In case you’re wondering, a no-dig gardener will add fertilizer and any soil amendments such as bokashi soil, compost or worm castings to the top of garden beds at the start of spring and autumn, and then cover the lot with a generous layer of mulch, and that’s all the soil work for the next season’s gardening! 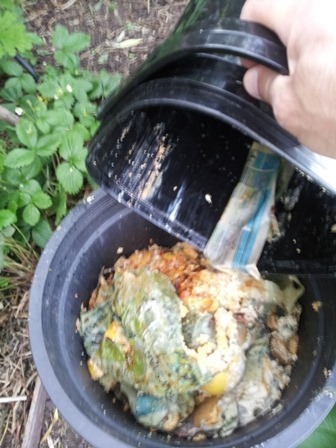 Adam Footer – “Bokashi Composting; Scraps to Soil in Weeks”, New Society Publishers, 2014. Fantastic article! I’d been wondering if something like this could work. My brother rents in a place with lots of space but no garden beds, and he’d been wondering about the different options for composting that doesn’t require a permanent structure. I reckon this is might be a good solution! Thanks so much for this article. Here’s what I did with my waste. https://anitaelise.com/2017/09/15/kitchen-waste-composting-at-home/ The instructions said to layer cocopeat with the fermented pickle and it would be ready in 2 weeks. 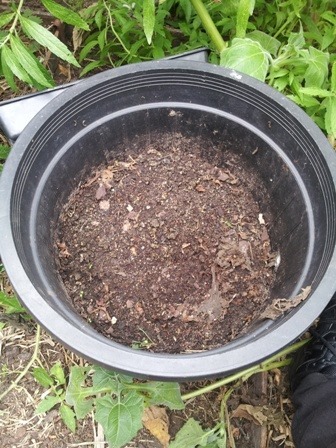 I found the older layer was composted, though a little wet, but the newer layer in the bin was not completely done. I think I’ll follow what you say and wait for 12 weeks until it is soil. Only, that is going to mean I need a lot more storage than I’d planned (I live in a flat/appartment and compost in my balcony. I’m also wondering if I could keep my original bin half full, covered with newspaper to prevent air exposure, and do smaller quantities. I found the full bin too big for my waste. Hi Eliza, you can thoroughly mix up the fermented bokashi waste with your soil or compost then cover it with a layer over the top to speed up the process. 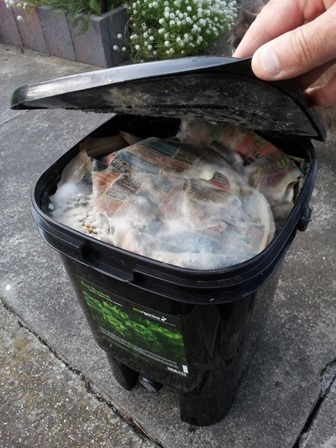 Your bokashi bin has to be sealed airtight until it’s ready, covering with newspaper won’t be enough, the lid needs to be on firmly. Bokashi bins come in various sizes, the small ones are quite compact.